Margaret Thatcher's premiership changed the face of modern Britain. Yet few people know of the critical role played by Jews in sparking and sustaining her revolution. Was this chance, choice, or simply a reflection of the fact that, as the Iron Lady herself said: ‘I just wanted a Cabinet of clever, energetic people and frequently that turned out to be the same thing’? In this book, the first to explore Mrs Thatcher’s relationship with Britain’s Jewish community, Robert Philpot shows that her regard did not come simply from representing a constituency with more Jewish voters than any other, but stretched back to her childhood. She saw her own philosophical beliefs expressed in the values of Judaism – and in it, too, she saw elements of her beloved father’s Methodist teachings. Margaret Thatcher: The Honorary Jew explores Mrs Thatcher’s complex and fascinating relationship with the Jewish community and draws on archives and a wide range of memoirs and exclusive interviews, ranging from former Cabinet ministers to political opponents. 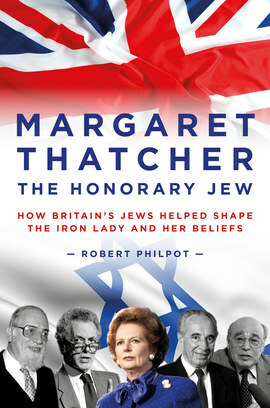 It reveals how Immanuel Jakobovits, the Chief Rabbi, assisted her fight with the Church of England and how her attachment to Israel led her to internal battles as a member of Edward Heath’s government and as Prime Minister, as well as examining her relationships with various Israeli leaders. I grew up in an inner-London, working-class household that was both Orthodox Jewish and rabidly socialist. The idea that any family member might support the Conservative party would have seemed frankly absurd. In my family’s imagination, the typical Tory was middle-class, well-to-do, church-going and certainly of an antisemitic inclination. Maggie Thatcher changed all that. By the time of the 1983 general election, both my parents were voting Tory and Maggie Thatcher was their heroine. My mother was convinced that the Tory leader must have had, in however nebulous a sense, Jewish roots. Genealogically speaking, of course, the Iron Lady had none. Margaret Thatcher (née Roberts) was a Grantham grocer’s daughter, schooled in a Methodist environment. But it was precisely this milieu — which encouraged hard work and self-help — that drew her to the Jewish people, a journey no doubt helped by the fact that, in 1938, her parents had taken it upon themselves to give board and lodging to Edith Muhlbauer, a teenage Jewish refugee from Austria and almost certainly the first Jew that the young Margaret had ever met. But the journey was never going to be straightforward. As Robert Philpot reminds us in his meticulously researched monograph, some of her early private letters reveal elements of the parlour antisemitism for which mid-20th-century Toryism was rightly infamous. In one, she appears to have felt no shame in referring to a woman who “looked a Jewess… [with] the typical long nose.” But the journey was made, aided and abetted by a small Jewish circle whose influence on her outlook and on her political judgment can hardly be overstated: principally Keith Joseph, Alfred Sherman and Immanuel Jakobovits. Philpot is at his best in chronicling this remarkable coalition, using material now available from the Thatcher archive. At its centre were Sherman, who had fought for the Communists in the Spanish Civil War but who ended up as Keith Joseph’s speech-writer, and another free-marketeer with East-End Jewish roots, Arthur Seldon (born Abraham Margolis), adviser to the Institute of Economic Affairs. It was through the IEA and its alumni that Thatcher was introduced to the “Chicago School” of neo-liberal political economy (also, incidentally, built on Jewish foundations: its leading advocate had, after all, been Milton Friedman). But scarcely less important as a mentor was Chief Rabbi Jakobovits, whom Thatcher deliberately put into the House of Lords to counter incessant complaining from the bishops of the Church of England. How much of all this reflected genuine philosemitism on Thatcher’s part? At the time it was said that Thatcher, the MP for Finchley, simply knew where her political bread was buttered. But Philpot leaves us in no doubt: she was indeed an honorary Jew.